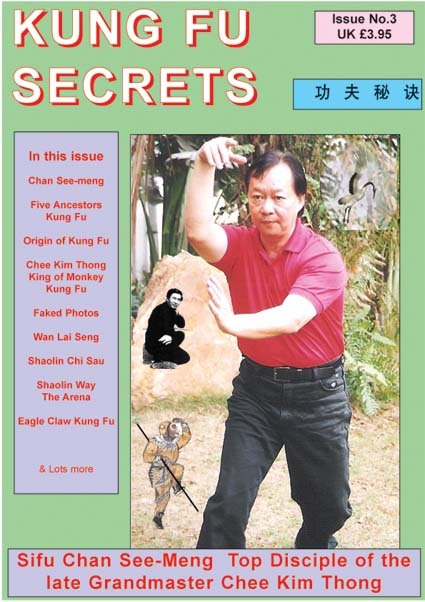 Kung Fu Secrets Issue No.2 shows the late GrandmasterChee Kim Thong (front cover) happily doing a monkey pose. It looks simple but the Grandmaster was over 70 years old. There was none of that unsteadiness when Sifu Yap Leong placed his left leg on the back leg and wrapped his right leg round the body of the Grandmaster. The issue was a second tribute to the late legendary Grandmaster, who had passed on his legacy to countless others. Available only in Shaolin Way and other martial arts outlets.